Blade of the North Wind is a beautifully rendered, dynamic fantasy story that had me immersed in a cinematic world where a twist in the story only pulled me out of its environment long enough for it to twist me back into where I thought I had been; only now the ground beneath my feet was slightly less solid. It played with my expectations as if it were a meat cleaver wielded by a monster of great girth and greater savagery. The story takes place in a land called Artharu where “a race of savage warriors known as the Kgarra trample over the realms of man with a ferocity that no one has ever seen.” Of course, a hero is needed to save the day - but is this all just an adventure story to fill the mind and daydreams of a young boy tired of being “trained in the everyday responsibilities of the village”? The story twists and then twists again and when I got to the end, all I wanted was to read more to get my questions answered. 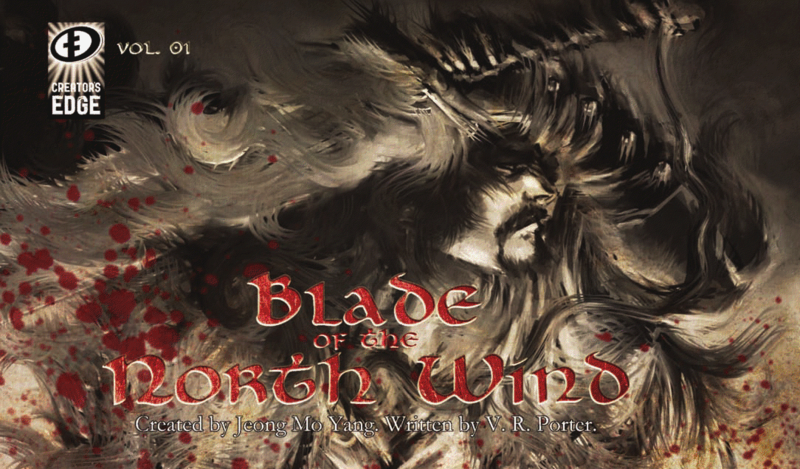 But what is most impressive about Blade of the North Wind is Jeong Mo Yang’s art. The layout of the book is like the storyboards for an epic feature film. I gather the book is meant to be viewed digitally, so that each panel will fill the entire screen. This only adds to its intensity. Yang’s monotone brushwork is expressive and evocative of Sumi-e art, full of ferocity and velocity, with sudden splashes of blood red adding an explosive spray of violence. In Blade of the North Wind we have the monomyth polished anew and invigorated by masterful art. Blade of the North Wind is a fantastic example of what small press comics can do when talented people are given the freedom to create their stories on their own terms.